The Completion Certificate and Occupancy Certificate from the Planning authority are essential for any construction as per the provision of law. These certificates evidence that the Commencement and Completion of the building are as per the approved plan and in compliance of Locals laws. Everybody heard about the word Commencement Certificate and Occupancy Certificate.’ But practically, most of the persons who are the owners of the buildings have not at all seen how the Commencement Certificate and Completion Certificate will be.The Commencement certificate is one of the most essential documents for the Apartment Construction.Only a few builders who are developing the mega projects are obtaining Commencement and Completion Certificates.Generally, for small Apartment owners, getting completion certificate is not possible because of the deviation and violation in the building construction. Some of the financial institutions and MNCs tenants are insisting on the Commencement Certificate and the Completion Certificate from the owners of the building. After the approval of the building plan, the owner shall give notice to the authority of the intention to start work on building site in writing. Further, the owner shall give notice to the authority on completion of foundation or footings before erection of walls on the foundation. Within 15 days from the date of receipt of such notice, the Engineering wing/authority shall inspect the site to verify as to whether the foundation work for the building conforms to the sanction plan or not. If the foundation work is according to the sanction plan, the authority will issue commencement certificate within the prescribed period from the date of the inspection. In any case, the construction shall be proceeded according to the sanctioned plan as if the permission for the commencement of the work is deemed to have been accorded. Further, the authority will verify as to whether the building has been constructed in all respects as per the sanctioned plan of the building, complied with Building bye-laws, including other relevant permissions or clearances obtained from the other departments. If everything is in order, Engineering Department will issue the Commencement certificate. with respect to issuance of Occupancy Certificate arises on account of violation of Building laws, such is almost 95% of buildings in Bangalore facing the problem. Though common people have spent their hard earned money on the project with a dream of owning a house, they are unable to get the occupancy certificate because of the deviations in construction of the building. Whereas, the Builders having a good connection, escape through various loop holes in law and extended their salable area. The Indian Registration Act,The Registration (Karnataka Amendment) Act 1975,The Karnataka Registration Rules 1965, govern the registration of documents.Every person may have to visit the office of registration for registering documents at least once in his lifetime,but provisions of Registration Act remain unknown to common public.This article discusses certain provisions, rules of registration. Our country is a land of many languages and there is no restriction as to which language should be used in writing the documents. But it is also not possible for the registering officer to know all languages.Section 19 of Indian Registration Act states that if any document in a language which is not understood by the registering officer and is a language not commonly used in the registering district, the registration may be refused, unless such document is accompanied by a true translation into a language commonly used in district and also a true copy. Kannada and English - All districts and sub districts in the State. The Act provides as to by which time, the documents should be presented for registration.Every document has to be presented for registration within four months from the date of execution as per section 23.The only exception is Will. But if the document has to be executed by several persons and each person executes at different times, such document has to be presented for registration and re-registration within four month from the date of each execution. However, the registration of documents presented after the expiry of four months is allowed on payment of fine as follows as per Section 5 of Indian Registration Act and Rule No.52 of Karnataka Registration Rules. a) Where the delay does not exceed one week Fine equal to registration fee b) Where delay exceeds one week but does not exceed one calendar month Fine equal to twice the registration fee c) Where the delay exceeds one month but not two months Fine equal to five times of registration fee. d) Where the delay exceeds two months but does not exceed four months Fine equal to ten times of registration fee. Where delay exceeds four months from the date of execution registration is not allowed. The fine is payable is in addition to regular registration fee. The documents which affect immovable property have to be presented for registration at the office of the sub registrar of the district in whose jurisdiction whole or a portion of such property falls as per section 28 and other documents not affecting the immovable property or copy of decree or order may be presented in any office of sub registrar in whose sub district the document was executed or in the office of any other sub-registrar under the State Government at which all persons executing and claiming under the document prefer. The decree or order may also be presented for registration in the office of the sub-registrar in whose sub-district the original decree or order was made (Sec.28, 29). A document which is registered shall be operative from the date of execution or from the date from which it was to operate as disclosed in the document and not from the date of registration (Sec 47). All registered documents other than Will relating to movable and immovable property shall have priority over oral agreements or declaration in connection with such property. But if such oral agreement or declaration is coupled by delivery of possession of the property and such possession constitutes a valid transfer under any law for the time being in force, such oral agreement or declaration has priority over registered documents. A Will made subsequent to earlier registered Will have priority over earlier made and registered Will.A mortgage by deposit of title deeds shall have priority over any mortgage deed subsequently executed and registered, when both relate to the same property (Sec.48). The Registering officer has to endorse the time, hour and place of registration and also the signature of the person presenting the document for registration on every document so presented and shall also be receipted. Every person who executes any document has to admit such execution at the registering office either personally or through his duly appointed agent or shall endorse such admission of execution.The endorsement shall contain the particulars such as signature and addition of the person admitting the execution, the signature and addition of any agent admitting the execution, the signature and addition of every person examined in reference to such document under any provisions of the Registration Act, payments and delivery of any goods made in the presence of the registering officer connected to the document presented for registration, admission of receipt of consideration in full or in part made in the presence or registering officer. If any person admits the execution but refuses to endorse, the registering office shall register the document, but shall endorse the fact of refusal. The provisions of admitting the execution and endorsement does not apply to copy of decree or order and documents sent to registering officer under special provisions provided in Sec. 89 of the Act (Sec.58). All such endorsements shall be signed and dated by the registering officer. After completion of process of registration the registering officer shall endorse a certificate on the document with the word “Registered” together with number and details of storage of the document. The certificate of registration has to be signed, dated and sealed by the registering officer (Sec. 60). Of late, people are extremely confused about the registration of transfer of properties. The registration process which was a smooth process hither to, all of a sudden has become very tedious calling various documents, approvals, orders, which were not insisted upon earlier. A document that is considered as correct in one Sub-registrar’s office is rejected as not correct in another Sub-registrar’s office.The Revenue department, the Department of the Inspector General of Registration, the Commissioner of Stamps and all the Sub-registrars are confused themselves and seem unable to guide the public. The two important points, that have affected registration are, the conversion of agricultural land to non-agricultural purpose and the approval of layouts.Agricultural land cannot be used for any other purpose, unless it is converted to non-agricultural purpose.Under Section 95 of the Karnataka Land Revenue Act, the Government recently introduced a ‘Single Window’ system for conversion of land. Apart from conversion of land, the layout should be approved by the concerned authority. Thereafter the building too needs to be approved.Generally, the Urban Development Authority in the district is the approving authority for layouts. But many layouts are approved by the city municipal councils, town municipal councils, and village panchayats, which have led to low quality development works, causing heavy financial burden on the local boards and the resultant in-convenience to the people.The conversion of land for any purpose other than agricultural should not be in violation of the approved master plan, CDP proposals.As far as Bangalore and surrounding areas are concerned, there are various planning authorities which approve layouts.Each planning authority has a specified jurisdiction. People should understand that the Bangalore City Corporation (BCC), the various city municipal councils, TMCs or the village panchayats do not have any authority to approve layouts which vest with the Jurisdictional Planning Authorities. Many problems have risen because of the unauthorized and indiscriminate approval of layouts by these authorities, exposing the public to hardships. Before we discuss planning authorities, we must understand the powers of various local bodies like the city corporations, municipal councils, TMCs and village panchayats, to approve building plans. Constructions are permitted only on converted lands and approved layouts. Village Panchayats may approve building plans with ground plus one structure within their jurisdictional areas only. Gramathana sites have come under strict scrutiny and many Panchayat boards have mindlessly issued Forms 9 and 10 and any approval of building plans on such gramathana sites require extra precaution. The gramathana sites can be identified by referring to a village map at the Department of Survey and Settlement. According to a new circular, such sites should be certified by the village accountant enclosing a rough sketch of the gramathana site indicating the exact location in the village map along with its boundaries. If the gramathana site satisfies all these stipulations, the Government will not insist on conversion, and the village Panchayat may approve a building plan of ground plus one floor on such sites. However, it is very difficult to identify genuine gramathana sites as a lot of bogus documents are in circulation. City municipal councils, TMC and the BCC may approve building plans of ground plus three floors only.Any building plan in excess of ground plus one in village Panchayat areas and in excess of ground plus three floors in the areas under the city corporations and municipal council’s needs approval from the town planning authorities. As stated earlier, layouts can be formed only on converted lands.The Karnataka High Court, in its Judgment in BDA V/s Vishwa Bharathi House Building Co-operative Society (1992(1) LJ 523B (DB) ILR 1991 KAR 440 (DB) has held that all agricultural lands within the jurisdiction of a city corporation are deemed to be converted.But the Government has clarified that there is no such deemed conversion, but that the competent authority may grant a conversion order. It is also clarified that though the betterment charges are paid to the concerned local authority, and the Katha is issued by the local authority, if such property comes under agricultural land earlier to payment of betterment charges, conversion of land to non-agricultural purpose is necessary under the provisions of Section 95 of the Karnataka Land Revenue Act (1964).Under such circumstances payment of betterment charges and the issuance of the Katha is not a conclusive proof of conversion. Each planning authority has a specified jurisdiction.The jurisdiction of the BDA comprises the area under the BCC, surrounding city municipal and town municipal councils and village panchayats. All applications may be addressed to the Commissioner, Bangalore Development Authority, Kumara park, Bangalore -20. The office of the BMRDA is located at the LRDE building, Ali Askar Road, Bangalore, and has its jurisdiction on Bangalore urban and rural districts and Malur taluk in the Kolar district, except the areas covered under the BDA, BIAPA and other local planning authorities.BIAPA also has its office at the LRDE building, Ali Askar Road, Opposite to Palace Guttahalli, Bangalore – 52, and has its jurisdiction over the proposed new airport and its environs. BMICPA has a jurisdiction over the small area of about 65 sq.kms comprising the Bangalore-Mysore Inter Corridor Area. Other Planning areas referred above have a jurisdiction over respective towns and environs.Planning areas under the BMRDA is very vast, but infrastructure available in the BMRDA is not enough for speedy disposal of approvals, causing much delay. In other cases, not referred above, the respective urban development authorities like the Shimoga Urban Development Authority, the Bellary Urban Development Authority etc., have the jurisdiction to approve the formation of layouts, if the lands are situated in their geographical jurisdiction. There are 27 urban development authorities in the State. Apart from these urban planning authorities, if land is situated in the areas under other planning authorities, the applications have to be referred to the Member Secretary of the concerned planning authority. There are 42 planning authorities in the state. If properties are located outside the jurisdiction of the BDA, BMRDA, BIAPA, BMICPA, urban development authorities and the Member Secretary Planning Authority, applications have to be submitted to the Assistant Director, Town Planning. Any development activity has to be approved by these planning authorities as per the provisions of the various laws and the local bodies have no authority to grant such permissions. All documents do not require registration compulsorily.The Transfer of Property Act, 1882 and the Indian Registration Act,1908 have made registration of certain documents compulsory while in respect of certain other documents it is optional.According to Section 17 of the Indian Registration Act,1908 registration of documents is compulsory if they relate to an immovable property.Similarly, Section54 of Transfer of Property Act 1882, stipulates that sale of immovable property the value of which is one hundred rupees or more should be registered. 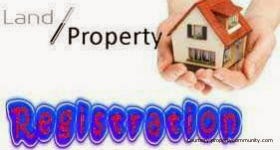 Since no immovable property is available for rupees one hundred or less than rupees one hundred, implicitly all sale deeds of immovable property need compulsory registration. Most of the instruments dealing with the immovable property for creating, declaring, assigning, limiting or extinguishing any right, title or interest in the property require compulsory registration, as enumerated under the Indian Registration Act, 1908. For executing an instrument, the first and the foremost aspect to be considered is the nature of the right intended to be transferred. If the document falls within the category of the documents which warrants compulsory registration, any avoidance of registration of such document would invalidate the document itself.For documents which require mandatory registration certain procedures are prescribed. Under Section 23 of the Registration Act, subject to certain exceptions, any document other than a Will has to be presented for registration within four months from the date of its execution.Execution means signing of the document.It is not uncommon that the date of execution and the date of registration may differ. For the non-testamentary documents such as Sale Deed, Gift Deed,Mortgage Deed, etc, the time limit within which the document has to be registered is four months from the date of execution. Decrees drawn in terms of Compromise Petition wherein shares of the parties are allotted by metes and bounds require registration. Even for registration of the court decree, four months time limit is stipulated under the Act. If the document is executed by all or any of the parties residing abroad, the same can be accepted for registration within four months from the date of receipt of the document in India. In case of doubt as to the validity of registration, the document may be re-registered within four months from the date when it is noticed that the registration is invalid or of doubtful validity. Where a document is executed by several persons at different times, it should be presented within four months from the date of the latest execution for registration.If a document is not presented for registration within the prescribed period of four months and the delay in presentation of the document does not exceed a further period of four months, then the parties can apply to the Registrar for registration of the document who may direct, upon payment of fine not exceeding ten times the actual registration fees, for registration of such a document [Sec.25]. A document relating to an immovable property can be executed out of India and later it can be presented for registration in India. As per section 26 of the Registration Act, 1908, if a document purporting to have been executed by all or any of the parties out of India is presented within the prescribed period of time for registration,the Registering Officer may, on payment of proper registration fee accept such document for registration if he is satisfied that the instrument was executed out of India and the instrument has been presented for registration within four months after its arrival in India. Fees charged for the registration or searching the register are prescribed by State Governments through Notifications. In case of Testamentary instrument, that is, Will, registration is optional and time limit is not prescribed.It can be registered any time before the death of the Testator.How-ever, it is advisable to register the same as soon as possible in order to avoid disputes about the genuineness of its execution. In case of registration of Will, the same may be presented by the Testator during his life time and after his death, by the beneficiary or the administrator, for registration. A Will may be deposited with the Sub-Registrar in a sealed cover and such deposit may be done through an agent.After the death of the Testator, the sealed envelope will be opened and the contents recorded in the relevant register maintained in the Sub-Registrar's Office.The Original copy of the 'Will' will be in the custody of the Sub-Registrar. Generally documents have to be presented for registration only at the Sub-Registrar's office within whose jurisdiction the immovable property is situated. However, in certain exceptional cases, documents may be presented for registration with the Registrar who has been conferred with the power to register the documents. In fact, Sub-Registrars have been vested with the special power to register the document at the residence or office of the executants or to accept deposit of Will. Documents which require mandatory registration have to be presented in the concerned Sub-Registrar Office for registration by the executants or person claiming under the Decree. However, in certain cases, the representatives of the Executants, duly authorized under Power of Attorney, can also execute the same on behalf of the Executants. A power of Attorney holder can execute the document, representing the Principal only if an authority has been vested in him under Power of Attorney, which is authenticated by the Registering authority within whose jurisdiction the Principal resides.If the Principal does not reside in India, then the Power of Attorney should be executed before and authenticated by a Notary Public or any Court, Judge,Magistrate, Indian Consul or Vice-Consul or the Representative of Central Government in that country and the same is required to be presented with the concerned registrar in India with in a period of three months of its receipt in India.When a document has been executed by more than one executants and after execution of the same, one of the executants refrain from attending the concerned Sub-Registrar's Office for registration, then the remaining executants can compel attendance of the executant reluctant to be present before the registering authority through the process of law. The Registering Officer is empowered under sec. 34 of the Registration Act to enquire whether or not the person is the same by whom it purports to have been executed such a document.He may insist on production of proof for his identity and in case any person is appearing as a representative or agent, the Registrar may ask for relevant documents to show that the agent or representative has the right to appear on behalf of his principal. What would be the repercussion if a document which requires compulsory registration is not registered? Section 49 of Indian Registration Act deals with this situation.It states clearly that such un-registered documents do not convey to the transferee a legally valid title and such documents are not admitted as evidence for any transaction affecting the property referred to in the document. However, there is an exception provided in the Act.The unregistered documents may be admitted as evidence in a suit for specific performance under Specific Relief Act or in any other related transaction, not required to be effected under a registered instrument. Documents are mainly registered for conservation of evidence, assurance of title, and to help an intending purchaser to know if the title deeds of a particular property have been deposited with any financial institution or person for purpose of obtaining loan or advance against security of the property. Registration of documents acts as notice to the public and to protect oneself against the likely fraud.Therefore, it is advisable to register all documents connected with the immovable property irrespective of whether the registration is compulsory or not as it creates a permanent record of event which are reflected in encumbrance certificates. As registered documents have higher value of evidence than unregistered documents it is always beneficial to you if you get all your property documents registered within the stipulated period irrespective of the fact that such registration is mandatory or not. After accepting the document for registration, the Registering authority shall endorse the document regarding affixation of the signature of the Executant, payment of consideration, date and other relevant particulars. If registration is declined by either of the party, the same shall be endorsed on the document itself. Apart from this, the Registering authority shall also endorse on the Document the registration number, Book number, pages, volume or CD number and affix the seal of the office of the Sub-Registrar. Such a Certificate shall be copied in the Register meant for the purpose and copy of the map or plan, if any, shall be filed in Book No.1.Thereafter, the registered document will be returned to the person who has presented the same for registration or to his representatives.